For many, coming to live in the UK may involve having to take a UK driving test. Driving tests vary considerably depending on which country it is taken and the UK driving test is renowned for being one of the more difficult tests. Often drivers from another country wishing to take the UK driving test will of had plenty of previous experience due to driving in their own country, so a full course of driving lessons is often not required. This section explains the UK driving test along with what’s involved and the recommended training needed to pass the test. The UK driving test duration is around 30 to 40 minutes and will include an eyesight test very soon after meeting the driving examiner. Before setting off for a drive, you will be asked 2 of the Show Me Tell Me driving test questions. After this you will take the examiner for a drive. The majority of the time the examiner will be providing you with direction on where to go. There will be a 20 minute section of the UK driving test however called independent driving where you will be shown a basic map and be expected to follow the map directions safely. There are 4 manoeuvres in the UK driving test. The manoeuvres are forward bay parking, pulling up on the right, parallel parking and bay reverse parking. Bay parking is dependent on if there are bays available at your test centre or if a test centre close by has bay parking. If so, your test may involve driving to another test centre for the manoeuvre. Driving test manoeuvres should be taken slowly, accurately and with plenty of observations. The driving test has around a 1 in 3 possibility of incorporating the emergency stop procedure. Although the emergency stop may seem simple, the examiners do expect this to be performed to a high standard and should therefore be practiced. There are around 370 UK driving test centres. You can choose to take your driving test at which ever test centre you desire. The cost of booking a practical driving test is exactly the same at each test centre. UK driving test centres are located in various areas from fast paced cities to quieter town areas. 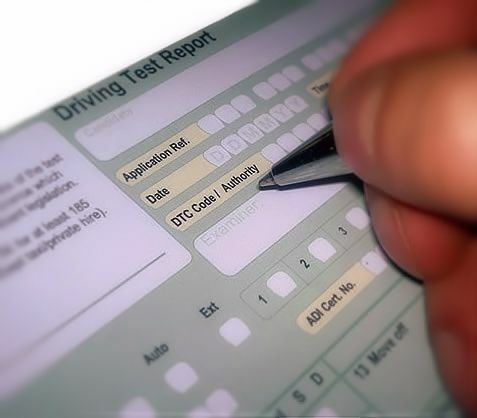 The UK driving test requirements are the same regardless of the test centre, although driving tests will vary from busy roads to country road driving, dependent of which test centre you are taking your test. Choosing a driving test centre that suits your preferred style of driving may benefit you although choosing a test centre in the location that you reside will give you more opportunity to study the UK driving test routes. A familiarity with the UK driving test routes for your particular test centre will be of significant benefit. The vast majority of test routes incorporate intentional difficult areas laid out by the driving examiners at each and every test centre. Although UK driving test routes are altered from time-to-time, the difficult areas are often limited due to the limitations of a test route radius and therefor often remain very similar. It’s these difficult areas that need practice. A good local driving instructor will have knowledge of these routes and will help you gain proficiency. You are required to take along to your driving test the plastic photocard provisional driving licence and to arrive in good time. UK driving test law states that unless you do not take your provisional driving licence, you will be unable to take the driving test and will lose your test booking fee. Arrive at the test centre no more than 10 minutes early as you may clash with other learners returning from their driving test. A suitable 4 seater car (not a convertible) is required and that it must be road worthy, taxed and insured for you to drive on public roads. Although it is likely you will have experience driving within your own country, the standards of the UK driving test are high. It is recommended that you take an assessment lesson with a driving instructor. This assessment lesson will allow the instructor to gauge exactly how far off test standard you are and will provide you with an overall amount of lessons they think you require to reach test standard. The usual amount of lesson required in this situation is from around 5 – 10 hours of tuition. Often it is a case of eradicating bad habits such as a lack of observations, mirror checks, road positioning and to become proficient with all the test manoeuvres. Some countries don’t use roundabouts very often and as the UK uses a high number of both large multi-lane roundabouts and mini roundabouts, driving lessons will often incorporate these. You are permitted to gain 15 minors in the UK driving test, any more and the test is a failure. You are only permitted to receive a maximum of 3 minors within a single category, again, any more will result in a failure. A single serious or dangerous major fault will result in a failure. The driving test report is explained and also read What to expect on a driving test to ensure you are fully aware of what is involved and practice on your own and with your driving instructor until proficient in all areas. Once you are reaching test standard, a mock driving test exam taken with your driving instructor is often a good measure of whether you are likely to pass or fail. Once the test is over, you have stopped the car and turned the engine off, the examiner will inform you whether you have passed or failed. If you have failed, they will explain the areas you failed in and why. Including this page, read all the driving test tutorials provided on this web site. The offer in depth information on passing the UK driving test. It is also important that along with these tutorials, you should take driving lessons from a qualified driving instructor to eradicate any bad habits that most drivers gain. The Show Me Tell Me driving test questions total 19 questions. The questions are related to car controls and maintenance. You will be asked only 2 of the 19 questions at the start of the UK driving test. If you fail to answer a single or both questions correctly, you will be marked with a minor. The independent driving part of the UK practical test is not to establish that you are good at following a map. In fact, it matters not if you get lost and don’t follow the map directions at all. It matters that under stress, you remain calm, safe and follow the correct rules and regulations for driving. It is acceptable to use your own car for the UK driving test. You must ensure all tyres comply with all safety and legal requirements (spare tyre is not checked) and that the car is appropriately insured for your use and is taxed. Your vehicle must have a front and rear L-plate on display and an internal driving test mirror for use by the examiner. Alternatively a car for the driving test may be hired from a driving instructor although many instructors prefer to take a few lessons prior to the test to ensure you are to a good standard of driving. UK driving test wait times are dependent on each test centre. Often test centres located in busy cities have the longest waiting time. Test waiting times can vary between a few days to several weeks. See further information on how to plan a driving test and to find out what your test centre waiting times are. Driving test times for UK practical test centres is usually from around 8.00am to 4.00pm. It is often beneficial to avoid taking a test during peak rush hour times as traffic density is significantly increased during these periods. At the start of the UK driving test, you will be required to read a new style number plate from a distance of 20 metres. You will be provided with 3 attempts at the eyesight test and if you fail the third attempt, the driving test will be terminated. See driving test eyesight test for further information.